Howard Mackey—long-time BLBC member, former BLBC president, former greens-keeper, former board-member, and former Memorial & Endowment Fund Trustee—passed away on April 15, 2019. Howard crammed a lot of life into his 93 years: he enjoyed taking it all in, and he could tell you hundreds of stories about sailing, RV living in southern California, life in the Bay Area from his childhood to the present day, and bowling. Life did not just happen to Howard – Howard went at life with a remarkable combination of enthusiasm, stoicism, and old-fashioned directness. Bay Area lawn bowlers consider Howard a Berkeley institution, but Howard considered himself an El Cerrito product. One of those rarities of California — a native — Howard was born to a family that lived in El Cerrito around B Street, near the current Harding School. Howard remembered the days when the dog track (the site of the El Cerrito Plaza) was the epicenter of El Cerrito, then the colorful and corrupt town that escaped Alameda County DA Earl Warren’s reformist wrath by sitting just over the Contra Costa County line. He sometimes talked about the squalid trailers not far from his home, where families who worked at the racetrack lived. Seeing this had a profound effect on the young Howard. He was proud of his parents’ work as supporters for what eventually became the El Cerrito Good Government League that in 1946 successfully recalled the corrupt city government and replaced 3 council members with league candidates. He would say that there were many reasons for them not to do what they did – but he felt they did the right thing. Howard seemed to live his own life making choices inspired by his parents’ integrity. Howard attended El Cerrito High School and returned to teach there until his retirement. The halls there have articles and photos of Howard serving his community. This writer had the pleasure of coaching former students of Howard who came through the BLBC gates years later. They would reminisce fondly about their time with him. Howard would want the story of his life to include what a powerful combination he and his wife Barbara (also a bowler and a BLBC member) were. They lived as though their good fortune, robust health, and ability compelled them to serve their community fully. Howard and Barbara joined the BLBC in 1993, and the couple bowled competitively for many years. The BLBC’s winners’ board includes the Mackeys in all kinds of competitions. They bowled regularly in PIMD tournaments and did the BLBC proud by bringing back many victories over the years. And whether he bowled well or not on a particular day, Howard never let the fever of competition overwhelm him: he always started and finished a game with a handshake and sincere thanks for the play regardless of the outcome. Howard bowled for many years as a lethal skip. In later years he preferred to bowl as an equally lethal second. Toward the end of his bowling days, he left the heavy lifting to others and shifted to bowling as lead. When he wasn’t working on the green or in the clubhouse, he was practicing with 2 sets of bowls, but with neither mat nor rink markers. He would bowl to a jack that he rolled anywhere on the green. He then walked to the jack, rolled it out to another random spot on the green and so on. During these practice sessions, Barbara might be reading on the bench near the memorial plaque in her name. When not bowling, Howard and Barbara served the club in countless ways. Barbara served as board secretary for several terms and Howard served two terms as BLBC president. Howard and Barbara enjoyed running the Berkeley Jamboree for quite a few years. They frequently were the first to come set up for events and draw games and just as frequently the last to leave when putting things away. Howard stepped up to serve as greenskeeper for several years, a thankless job that he took on with grace and equanimity. A common sight would be Howard hunched over a piece of machinery, confidently dismantling and reassembling it. He might tell an observer about the first time he worked on a piece of machinery like it — and how he completely messed it up. Ever the teacher, Howard wanted us to know that failure followed by trying again was the key to everything. Barbara died in 2012, and that took its toll on Howard. He did not dwell upon his loss in a public way, but if he was comfortable with you, he would speak of his loneliness and how strange it felt for him to wake up without Barbara there. He also frequently spoke of the happiness and joy his family brought to him: he knew himself to be lucky and was grateful. And that is how we at the Berkeley Lawn Bowling Club feel about Howard and Barbara. They gave so much time, labor, love, and goodwill to the BLBC and its members. A grateful BLBC community shall remember them fondly for what they cheerfully provided in so many ways. We offer our condolences to the Mackey family. 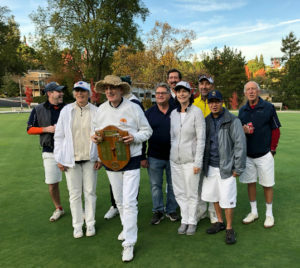 Note: A memorial service for Howard Mackey will be held at the Berkeley Lawn Bowling Club on June 15, 2019. The BLBC recently received news that former BLBC member George Goldman passed away in June of this year. George joined our club and bowled enthusiastically for quite a few years. Several years ago he started treatment for leukemia, and the treatment gave him valuable additional time,but took its toll on his physical strength. George himself likely would have admitted as much. He proudly honed a rational approach to life and offered an unblinking and unsentimental assessment of his state and prognosis. That sounds more serious than George was: his curiosity and sharp sense of irony made George a voluble and entertaining raconteur. 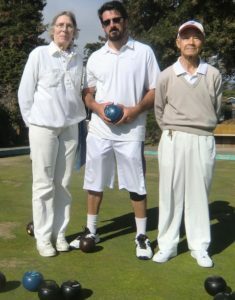 Outside of his lawn bowling life, George worked at the University of California in the Extension programs as an economist specializing in agriculture. He was one of the charter members of the BLBC’s poker group. Imagine George and several other economists at the poker table waxing eloquent on various economic issues of the day in technical detail. The non-economist at the table might think this distraction would help someone focused on the poker score. Alas, for that non-economist (like this writer), when George sat at the table he won more frequently than he lost when the night’s counting out was through. Any conversation with George might cover economics, bowling,music, cooking, camping, travel, softball, or any other topic, really. He was a charming, forthright, funny, curious and sincere man. The BLBC offers its sympathies to the Goldman family. (Note: more information about George can be found from the notice in the San Francisco Chronicle at this link: https://www.legacy.com/obituaries/sfgate/obituary.aspx?n=george-goldman&pid=189345558). 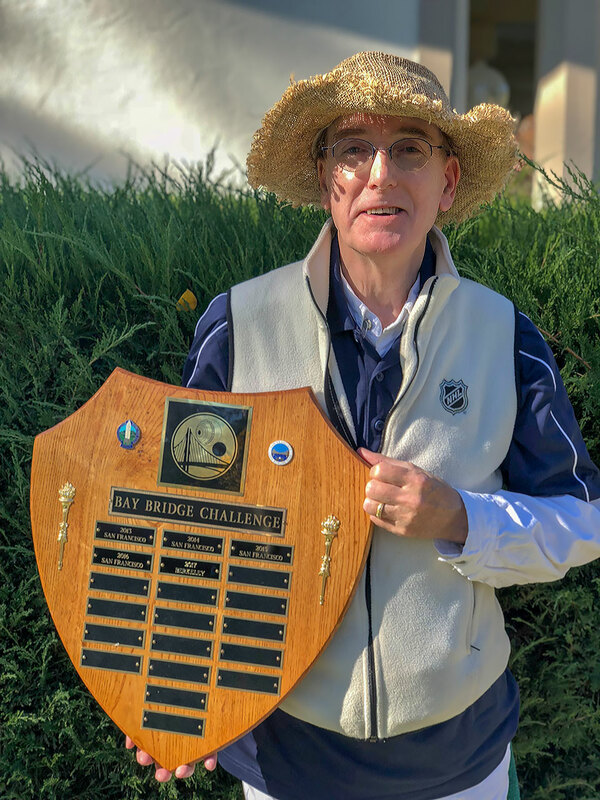 Last year, Frankie Napoli of Rossmoor Lawn Bowling Club, and also a dual member of Berkeley Lawn Bowling Club, reinstated the Rossmoor vs BLBC Challenge. We played two 14-end games. We were tied going into the afternoon. 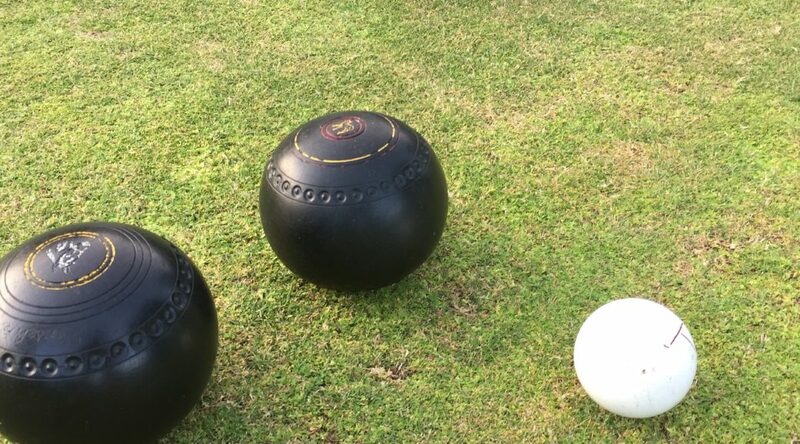 Three games were decided on the final bowl. Sadly for BLBC, all three bowls were delivered by Rossmoor teams giving them the trophy. This year, BLBC once again entered four teams. Once again we would play two 14-end games. However, upon arrival at Rossmoor we learned they had eight teams. In the spirit of “good camaraderie and everybody bowls” we were happy to have two Rossmoor teams bowl for us. Three all-BLBC teams won their morning games: Jim Corr, Cris Benton, and Bob Schwartz; Rob Hoey, Ray Francis and Jerry Knott and Frankie Napoli, Annie Brillhart and Erwin Vista. Team Ethan Bortman, Dave McMullen and Laile Giansetto were tied going into their last end. They lost the game by a fraction of an inch measurement. So, the score was tied three to three. BLBC continued to bowl well in the afternoon games. All four all-BLBC teams won handily giving us the victory! Although none of the Rossmoor teams bowling for us won any of their games, we were very happy to have them on our side! Congratulations to the bowlers who represented our club today! Berkeley Bowlers with the Challenge Trophy. Left to Right: Rob Hoey, Ann Brillhart, Jim Corr, Ray Francis, Cris Benton, Laile Giansetto, Dave McMullen, Erwin Vista, and Ethan Bortman. Not pictured: Jerry Knott, Frankie Napoli and Bob Schwartz. 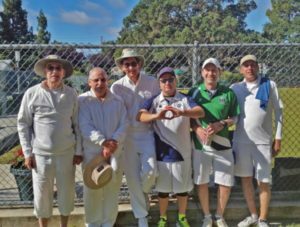 On a beautiful August summer Saturday, forty bowlers from around the Bay participated in this year’s tournament; which was hosted by Berkeley, but played in Oakland. 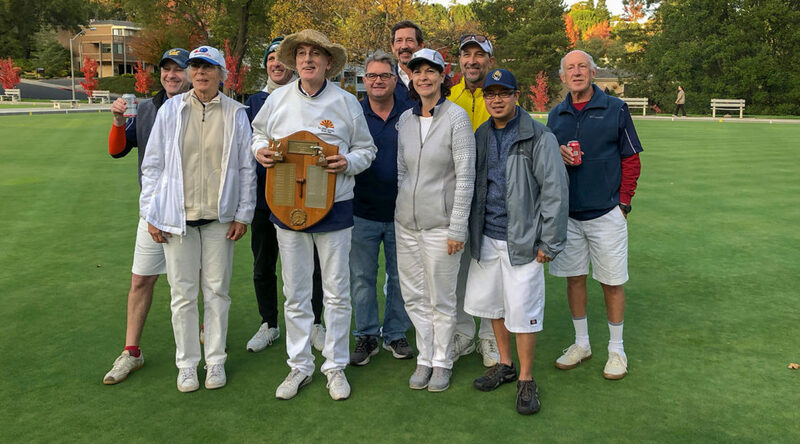 We’re proud that ten bowlers from Berkeley played on the greens – and especially pleased that a Berkeley team took First Place! Congratulations to Sarah, John, Cathy, and Cris. Winners: BLBC’s Sarah Allday, John Hooper, Cathy Dinnean, and Cris Benton. 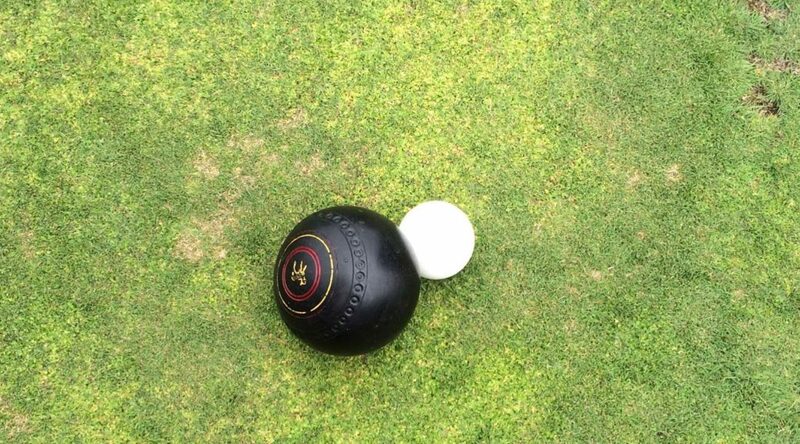 Twelve bowlers waited to see who they would be bowling with (and against) in our club’s 2016 Triples Draw Tournament on July 16. It was a perfect round robin with the top two teams to play for the championship. Des, Millard and Dave won all three of their games. (Excellent bowling you guys!) There was a very tough battle for second place between teams Erwin, Ray and Bob, Cathy, Phil and Ted, and Shawn, Ann and Luo. With a truly extraordinarily super bowl by Shawn at the last end of our third game, he moved his team into second place. Now his team had a tough assignment: Beat the team (Des, Millard and Dave) that had just beat his team by two points. Well, Shawn’s team was definitely up to the challenge. They won with points to spare. Congratulations to Shawn, Ann and Luo! 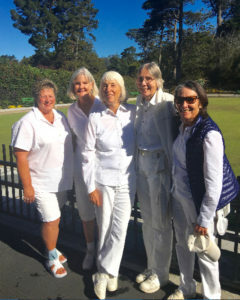 took 1st place on July 10 in the 2016 PIMD Women’s Fives tournament at the San Francisco Lawn Bowling Club. Ginger took on the difficult (and lonely) task of bowling the singles game in the morning. Several rinks over, Cathy did an admirable job of skipping, Ann, Cheryl and Sarah in the fours game. (Sarah’s jack rolling and bowling to the jack were awesome!) After a break for lunch, Ginger and Cheryl won a close pairs contest, and Cathy, Sarah and Ann won the triples game with points to spare. This team is the only team that day to win all its games. Congratulations! Berkeley bowlers put in a strong performance at the PIMD Men’s Singles Championship event and Jim Corr came home with the 2016 title. (PIMD is the Pacific Inter-Mountain Division of BowlsUSA, comprising clubs in Northern California, Utah, and Hawaii). 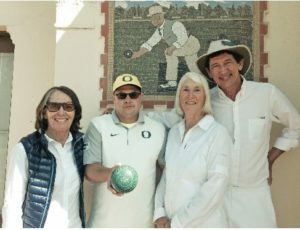 The competition, held at the Sunnyvale Lawn Bowling Club the weekend of May 14-15, brought together 16 of the top players from all over the Bay Area. Eight contestants at the end of Day 1 went on to the Championship “A” and “B” Flights on Sunday, with the next four being placed in the “C” Flight and the lowest four in the “D” Flight. In his first game Sunday morning, Jim got off to a good start, beating Miguel Roliz of Rossmoor LBC, the only player who had defeated him on Saturday. This set up a semifinal match against Cris Benton, a fellow Berkeley bowler, that turned into a nail-biter. Jim took an early lead only to see Cris draw level and then surpass him to reach a 17-13 lead. With 18 points being the winning goal, Jim had to dig deep, but eventually managed to prevail by the narrowest of margins, eking out an 18-17 victory. The final again matched two Berkeley bowlers against each other. Jim faced Frankie Napoli, a dual member of Berkeley and the Rossmoor Club. While not as close as the semifinal, the match nevertheless proved a tough one, Frankie coming within two points (13-11) of leveling the score, but Jim held on to take the game by 18-13 and the 2016 title. Overall, with Rob Hoey winning the “B” Flight, Berkeley members ended up with four of the top five spots, a great showing. Congratulations to all. Berkeley participants at 2016 PIMD Men’s Singles Championships. From left: Jim Corr, Des Simpson, Cris Benton, John Hooper, Rob Hoey, Frankie Napoli. We really mean it. 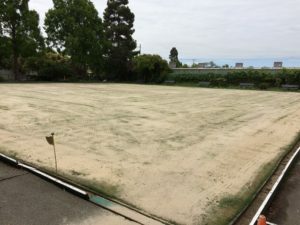 On Friday, May 6, several hearty BLBC members hauled little cores of wet turf off the green to make it ready for receiving sand. On Sunday morning (May 8) a mostly new crew came to shovel sand into the sander’s basin. 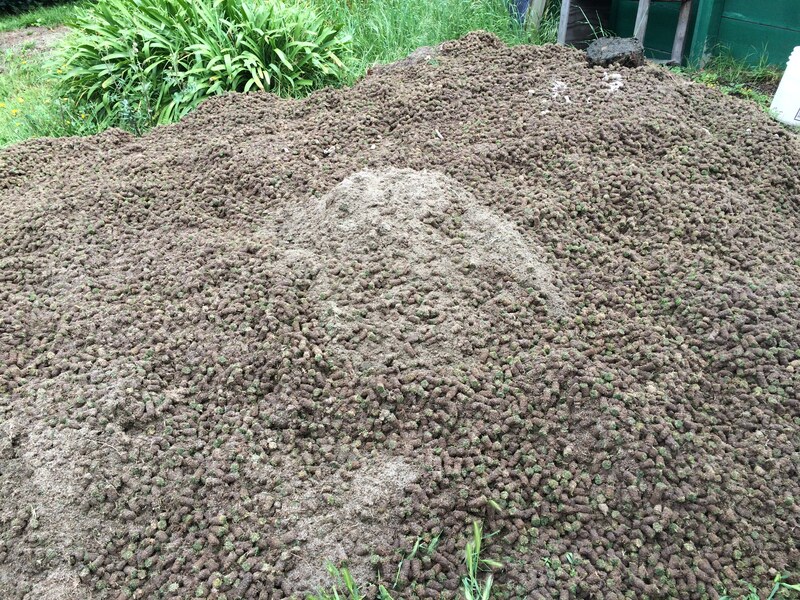 It was physical labor that required over a dozen loads of sand to cover the green. Each time the sander returned to the sand shed, the team filled the sander. After a few loads, the team managed to refill the sander in under 2 minutes. They felt like an Indianapolis 500 pit crew! Next came spreading and sweeping the sand. 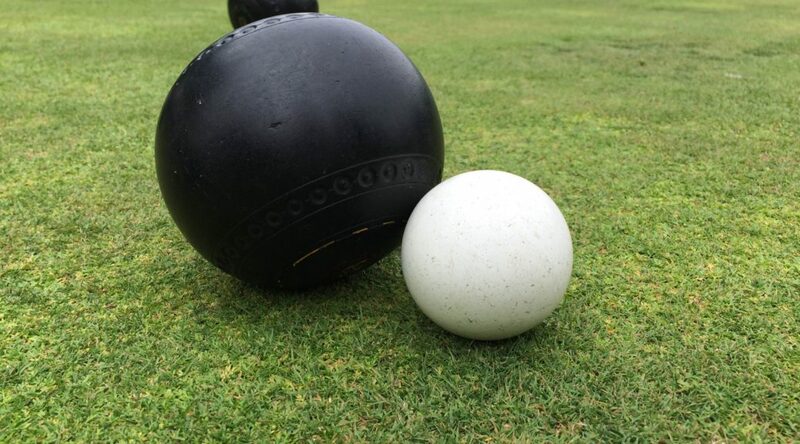 As the pictures show, being a self-supporting lawn bowling club requires the work of fellow bowlers. The results will make the bowling better. 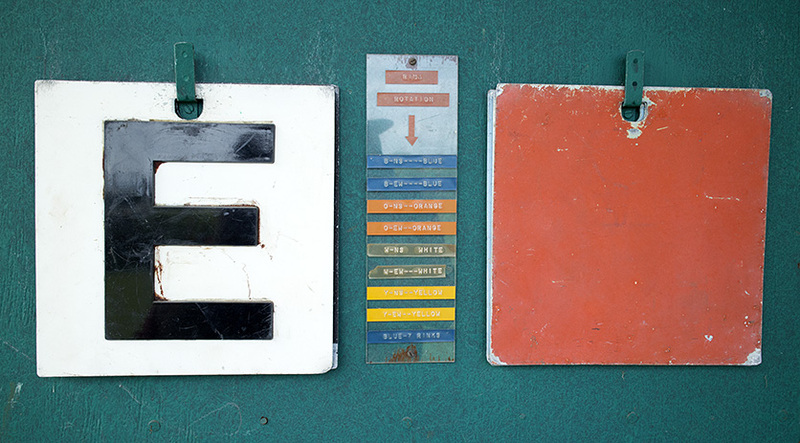 Keeping the green running well is not magic, but hard work. Thanks to the teams who made this work happen! The cores taken from the green were heavier than usual this time because of the recent rain. 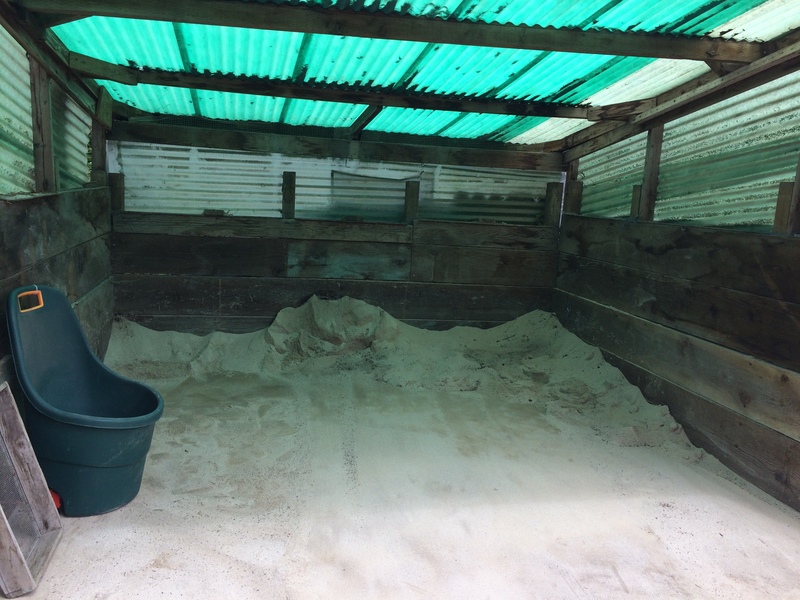 The sand shed was around half full when the crew started! Lucille McGuire passed away on October 18 in San Luis Obispo, where she lived near her daughter and grandchildren for the last several years. She was 92 years old. Lucille joined the Berkeley Lawn Bowling Club in 1983 and served the club as a board member and secretary for many years. She also worked on the coaching and hospitality committees. Lucille was born in Martinez, but was by all other measures a Berkeley native. She attended the University of California and raised a family on Ensenada Avenue in North Berkeley — just a short walk from her childhood home on the other side of Colusa Avenue. She liked to tell the story of her family piling into her father’s car and driving across the Bay Bridge the day it opened. Her father missed a turn, and they wound up driving to San Francisco on the lower deck, which was then just for passenger trains and large trucks (“He wasn’t a very good driver,” she would dryly remark.). In some ways, Lucille was born into a Berkeley that began to disappear in the post-war era, but she cherished her hometown and knew Berkeley was special. She volunteered at the gift shop of Herrick Hospital, and she surprised several of us when she told us she had been involved in a protest at the Diablo Canyon nuclear plant (San Luis Obispo County) in the 80s. Lucille didn’t blink from doing what she thought was right. Lucille married a veteran of World War 2, William McGuire, and she proudly accompanied Bill to many reunions of his Army Air Corps comrades. Bill died in 2003 (after over 50 years of marriage), and Lucille moved to San Luis Obispo to be closer to family a few years later (she was a proud parent and even prouder grandmother). Lucille held her friends and herself to very high standards; you never had to wonder where you stood with her. She knew that a club like the BLBC depends on the diversity of its members: she did not have to agree with everyone she met (and she didn’t), but anyone who came to bowl earned her good will and respect. She was fiercely loyal to her family, friends, town, club, and game. 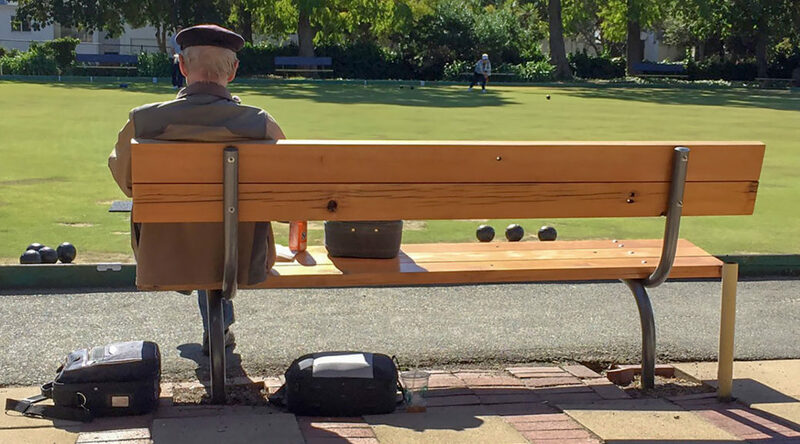 We offer our condolences to Lucille’s family and remember Lucille fondly for her contributions to the history and the legacy of the Berkeley Lawn Bowling Club. Lucille’s and Bill’s ashes are buried in a plot at the San Francisco National Cemetery in the San Francisco Presidio, near her parents’ grave site and within easy view of the Golden Gate Bridge.